Dr. Nu’Man is currently an Assistant Professor of Mathematics at Ursinus College in Collegeville, Pennsylvania. Prior to coming to Ursinus, she was the Ann Plato Postdoctoral Fellow at Trinity College in Hartford, Connecticut. Dr. Nu’Man earned her Ph.D. in mathematics from the University of Nebraska-Lincoln (UNL) with specialization in Geometric Group Theory. Dr. Nu’Man was born and raised in Atlanta, Georgia. While in high school, she loved her mathematic and english classes and graduated from Warith Deen Mohammed High as valedictorian. After high school, she enrolled in Spelman College not really sure what she would major in. Always intrigued with problem solving and deductive reasoning she either wanted to be a detective or a lawyer. She continued to take math classes, partly to fulfill college requirements and partly because she just enjoyed doing math. 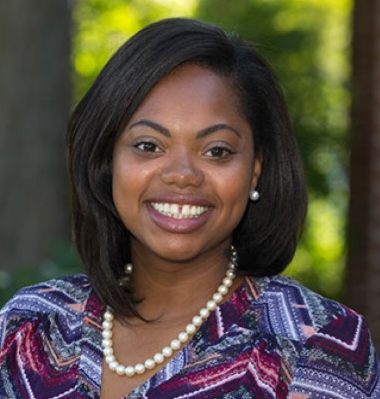 During her sophomore year, she was encouraged by her English professor, Dr. Akiba Harper, to apply for the Mellon Mays Undergraduate Fellowship, a program centered around increasing diversity of faculty at colleges and universities. This was the first time she considered mathematics as a potential career and teaching at the college level as an option. With the help of many of her math professors (Dr. Monica Stephens, Dr. Sylvia Bozeman, and Dr. Mohammed Tesemma to name a few) Dr. Nu’Man was encouraged to participate in the Enhancing Diversity in Graduate Education (EDGE) Program and pursue a Ph.D. in mathematics. To date, two of the academic accomplishments Dr. Nu’Man is most proud of is first deciding to walk during graduation when she earned her masters degree. While in her fourth year of graduate school, Dr. Nu’Man’s father passed away. His everlasting support continued to drive her to finish her doctorate degree. Her second most proudest accomplishment was finishing her Ph.D. She is truly blessed to be part of a community of family, friends, and mathematicians who saw her potential and supported her along the way. Now as a professor she shares her love and passion for mathematics with her students. If she could impart any words of wisdom and inspiration they would be: Spend your time pursing what you’re passionate about. Be patient with yourself and trust the process. Succeeding at everything you’re pursuing is ideal, but it can also be an indication that maybe your not dreaming big enough.